Desktop computers are losing their grip on the internet - and your fridge, TV, car and mobile phone are the future of how we get online, it has been claimed. By 2018, global Internet traffic will be almost evenly split between PCs and 'other' gadgets, which will including tablet, cameras and even smart home appliances, network firm Cisco has claimed. It says internet traffic will increase nearly three-fold over the next five years due to more Internet users and devices - but that even bigger changes are to come. How the internet will look in 2018: Global internet traffic will be almost evenly split between PCs and 'other gadgets, which will include tablets, cameras and even smart home appliances, network firm Cisco has claimed. HOW MUCH TRAFFIC WILL THERE BE ONLINE? The firm says the huge rise will be as a result of millions of 'things' being put online in its annual Cisco Visual Networking Index Global Forecast. Products such as lightbulbs, fridges, cars and even pet accessories already have internet connections, and more are expected to come as Apple and Google are both working on system to make them easy to control. 'The Internet of Everything is also gaining momentum and by 2018 there will be nearly as many machine-to-machine (M2M) connections as there are people on earth,' the Cisco report said. It also said the rise in smart, connected cars will have a huge impact, with navigation systems, entertainment systems and even self driving software all requiring an internet connection. 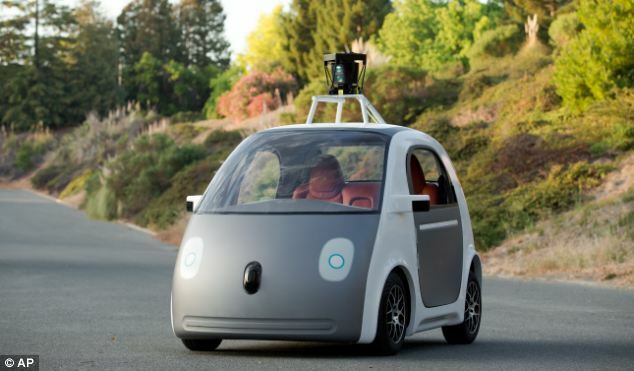 'Smart cars will have nearly four M2M modules per car,' the report said. Overall, the amount of internet traffic is expected to increase to 1.6 zettabytes - a billion terabytes. Doug Webster of Cisco said this was a major milestone. 'Our first Cisco Visual Networking Index nine years ago established the zettabyte as a major milestone for global IP traffic,' he said. 'Today, we are firmly in the ‘Zettabyte Era' and witnessing incredible innovations and shifts in the industry. According to the Cisco Visual Networking Index Global Forecast and Service Adoption for 2013 to 2018, global Internet Protocol (IP) traffic will increase nearly three-fold over the next five years due to more Internet users and devices, faster broadband speeds and more video viewing. 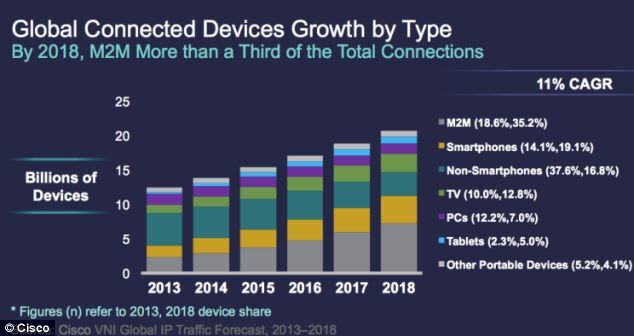 Global IP traffic for fixed and mobile connections is expected to reach an annual run rate of 1.6 zettabytes – more than one and a half trillion gigabytes per year by 2018. 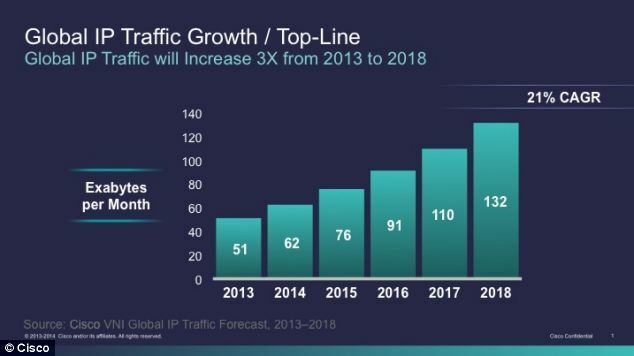 The composition of IP traffic will also shift dramatically in the coming few years. During the forecast period, the majority of traffic will originate from devices other than personal computers (PCs) for the first time in the history of the Internet. 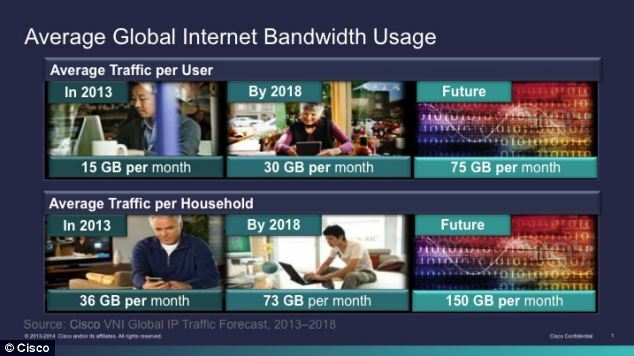 The amount of bandwidth used by users will increase from 15gb per month to 75gb per month, researchers claim. Mobile and portable devices other than PCs will drive the majority of traffic by 2018. Wi-Fi traffic will exceed wired traffic for the first time and high-definition (HD) video will generate more traffic than standard definition (SD) video. Experts also predict the emergence of ultra high definition (UHD) content will have a big impact. 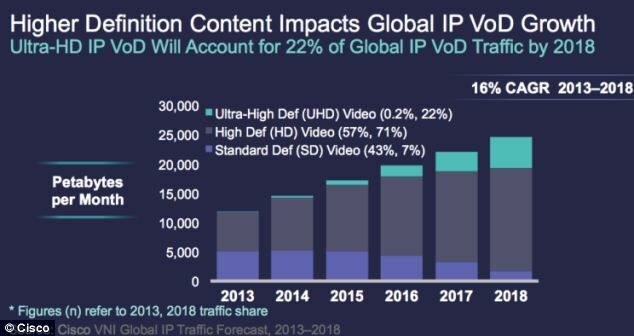 'Ultra HD video will account for 11 percent of IP video traffic by 2018, up from 0.1 percent in 2013,' the report said. UHD services, which require a new TV, are only just becoming available, with Netflix having house of Cards and select other shows available already. Ultra HD content is set to have a major impact on traffic by 2018, researcher believe. The firm also said the World Cup is set to give traffic a major boost. 'With the FIFA World Cup 2014 set to begin on Thursday, millions of people are expected to view games and/or highlights via the Internet. 'Video streaming and IP broadcast of the World Cup is anticipated to generate 4.3 exabytes of IP traffic, which is three times the amount of monthly IP traffic currently generated by Brazil (this year's World Cup host city).